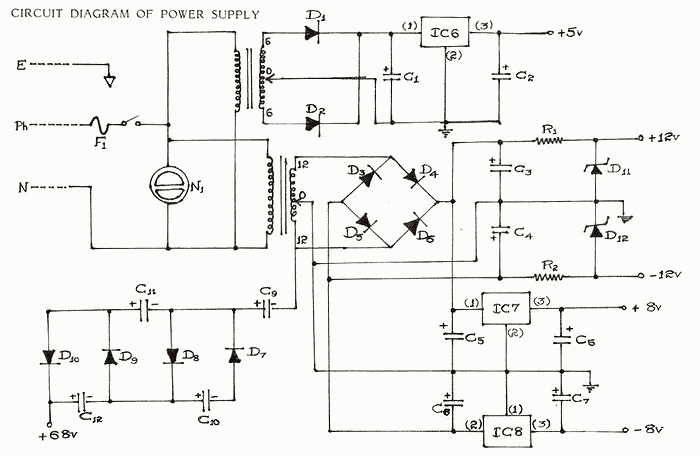 List Of Components For Power Supply. 5. Miscellaneous - F1-250ma, N1-Neon, 3-Pin Mains Chord. The required D.C. power supply is usually obtained by means of a transformer. It is also possible to have transformer­less power supplies. Though the elimination of the transformer makes the circuit compact, economical and simple, also facilitating quick assembly and built in short circuit protection, certain drawbacks creep in. These power supplies are useful only for low current applications. Special safety precautions ? are to be followed while using them. Physical contact should be strictly avoided, since the output terminals are not isolated from A.C. mains supply. This obviously necessitates the use of a transformer. By suitable modification it is possible to obtain multiple/ fractional dual voltages from a transformer. Different not-so obvious voltage values can also be obtained from the transformer by rectification circuits. The output so obtained from a transformer secondary is unregulated. For good load regulation, the internal impedance of any power supply should be as low as possible. The regulation can be improved either by resistor zener method or series regulator method. However, the three-terminal regulators greatly simplify the power regulation problem. These regulators need no external components. They employ internal current limiting and thermal shutdown which make them tough. For simplicity, compactness, convenience and accuracy the use of three­ terminal regulators is ideal. These IC voltage regulators are freely available in various ranges both positive and negative. A functional schematic of a three terminal regulator is shown in the datasheet. It can be seen that the device is a complete regulator, with built-in reference, error amplifier, series pass transistor and protection circuits. The protection circuits include current limiting, safe area protection to limit dissipation in the series pass transistor and thermal shut down to limit temperature. Two transformers have been used to step down the voltage from 230-250v a.c. mains input. One of the transformers produces an output of 6-0-6v at the secondary terminals. This output is fed to a full wave rectifier and a capacitive filter. The filtered output is fed to IC6 which is a 3 pin voltage regulator which gives a regulated output of + 5v. This is used to activate the DPM circuit. It is also fed to the temperature network as a precision voltage reference source. The other transformer produces an output of 12-0-12v at its secondary terminals. The centre tap is grounded like in the previous case. The other two terminals of the secondary are fed to a bridge rectifier constructed using diodes. The rectified output is filtered by using capacitor C5 and C6 fed to IC7 and IC. The IC7-8 which is are 3 pin voltage regulators gives an output of ±8v. These two voltages are fed to the signal generator. The -8v source output is fed to the temperature network, also as voltage reference. the operational amplifiers need not be very efficiently regulated to + 12v, the use of zener diodes proves economical. You can notice it had moving coil voltmeters and ammeters and analog potentiometers for settings. For the testing of electronic components a voltage of above 50 V is required. This can be achieved by means of a voltage quadrupler circuit. It consists of four diodes and four electrolytic capacitors. The secondary ungrounded terminal of the 12-0-12v is connected to the quadrupler circuit. The output of the quadrupler circuit is 68v with respect to ground. The two transformers can be controlled by the power supply switch PS 1 The switch also controls a neon lamp, which lights up once the transformer supply is on. The instrument is prevented against short circuits-excessive voltages by fuses. When the a.c. power supply exceeds beyond 250 volts resulting in any overload or damage, the fuse F1 blows out thus saving the rest of the circuit within the instrument. The a.c. power is drawn from a 3 pin plug connected to a cable of 1000 mm to activate the instrument. The ground terminal in the 3 pin plug is earthed to the chassis, while the other two terminals are connected to the primaries of the two transformers. Errata- D7 one end should be grounded.